Fiesch resort is little known outside Switzerland - it is a hidden treasure with some great skiing, located in the car-free, traditional Swiss village giving you a great opportunity to embrace the local culture. Local ski instructors will show you super off-piste runs from Eggishorn (2926m) - from where you can overlook the entire Aletsch glacier. The resort also offers well-maintained winter hiking trails that are very popular amongst locals. Traveling to Fiesch ski resort can be done in comfort and ease if you choose Alps2Alps as your ski transfer provider to have a great start to your ski holidays. The resort is located in Valais region in Swiss Alps near Italian border. It is a part of Aletsch Arena, which also includes Riederalp and Bettmeralp, giving you a total of 104 km downhill pistes to enjoy. Aletsch Arena geographically is a part of UNESCO World Heritage, therefore you will be able to capture unspoiled natural landscapes, imposing peaks and magnificent glacier - definitely a life-changing experience. Plenty of accommodation offers on this sunny car-free plateau are right at the pistes. There are plenty of off-piste activities like snowshoeing, sledding, ice skating to just name a few and there is also indoor sports resort ‘’Fiesch Sport and Leisure Center’’. There is a direct train to Fiesch - the train station is in the village and there are train connections from all the biggest Switzerland's cities. Booking your transfer to Fiesch for midweek (Monday-Friday) means that the prices will be up to 60% lower than usual weekend prices! Also, booking your transfer during the off-season and off-peak means that you will save even more. Vehicle availability, vehicle utilization, schedule of transfers and other costs like road tolls and parking fees are taken into consideration when calculating the final transfer price to Fiesch. In order to discuss any specific needs of your trip to Fiesch or your plans to travel as a larger group, please get in touch with us directly. Fiesch ski resort has snow park for snowboarding enthusiasts and with pistes above 2500m, both snowboarding and skiing is assured throughout the season. 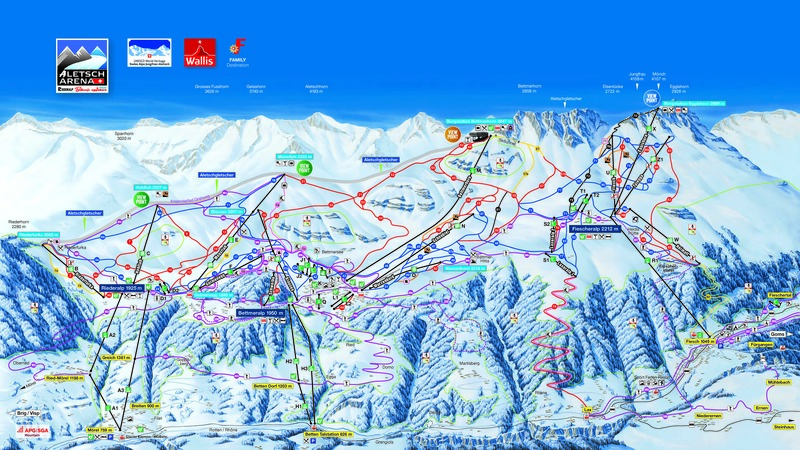 With Aletsch Arena Ski Pass you can enjoy also other resorts nearby. The resort is perfect for families - it has been awarded the Family Destination label by the Swiss Tourism Federation. There is "ski for free" offer for children and teenagers every Saturday all year long. Fiesch Snowsport School will help every member of the family not only to improve their skills but also will help to create a charming and memorable experience. We recommend booking your transfer to Fiesch in advance to get the best possible deal. Get in contact with Alps2Alps - we will be more than happy to provide you with excellent service!